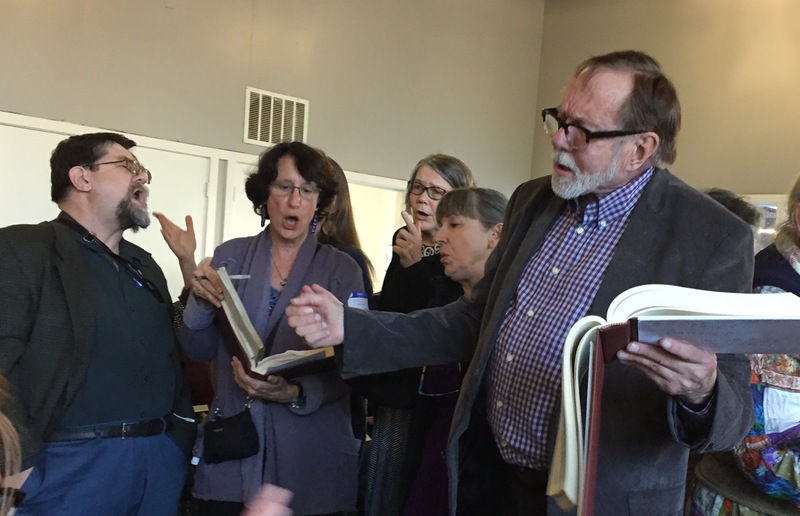 Ted Mercer leads a song at the California Sacred Harp Convention. I am the chaplain this weekend for the 30th Annual All-California Sacred Harp Convention, where over a hundred singers have gathered from a dozen states (along with a few enthusiasts from Europe) to sing about 190 shape note songs over the course of two days. It’s an intense immersion in a uniquely American repertoire––loud, raw, and deeply expressive. You can read about it in my post, A Musical Tsunami. While the song texts mostly reflect images and themes from 18th and 19th century Christianity, a shape note gathering is not a community of religious consensus. Non-Christian people of faith and no faith are in the mix, and there is no discussion of verbal meanings. It’s all about the singing. And yet, there is a sense of “church” about these gatherings. We tap into a power beyond the self, form bonds of communion with one another, and are transported by a shared experience that can verge on the ecstatic. By long tradition, each day of a singing convention opens and closes with prayer, composed or selected at the discretion of the chaplain. The following prayers are mostly my own. While seeking to honor and express the sacred dimension of a shape note singing, I tried to be inclusive, avoiding explicit sectarian language. But you may notice some Anglican phrasing––and theology––seeping through. O divine Beloved, Maker of all things and Lover of souls, we are gathered here by your grace to sing the life that conquers death, the joy that dries all tears, the peace that passes understanding, the love that resists every evil. Be known to us in the music we make and the songs we share. We are truly thankful for the generations of composers and singers who have entrusted us with the Sacred Harp, and we pray that our singing in this place will gladden the whole company of heaven with an awesome and holy sound. Draw us together with the cords of friendship. Lift up our hearts and make us one. Now sanctify this hollow and hallowed square, that it may be for us not just a refuge from the storms of the world, but a tangible experience of our truest humanity, reflecting your glory in the harmonious beauty of our shared communion. and spread before us by generous hands. and deepen our gratitude for life. Blessed be your Name forever. Amen. in our gladness and in our grieving. in our falling and our restoring. in bliss both human and divine. rejoicing in the power of the Spirit. Amen. * Brian Wren is an Anglican hymn writer in the UK. a eucharistic dismissal from the Book of Common Prayer. This day and evermore. Amen. it is with gratitude and joy that we receive the gift of this meal. other lives becoming our life. and make us ever mindful of the needs and rights of others. Let all the people say: Amen. * Adapted from various sources. The first line is from Gerard Manley Hopkins, the last lines are at traditional grace, and the middle part I learned from a priest at a campfire on a kayaking retreat for clergy. I don’t know the source. yet have we not heard your voice sounding in our midst this day? yet did we not glimpse your glory in the faces of one another? a word of encouragement or mercy? in union with the countless singers who have gone before us. Our hearts are full, and we are deeply grateful.